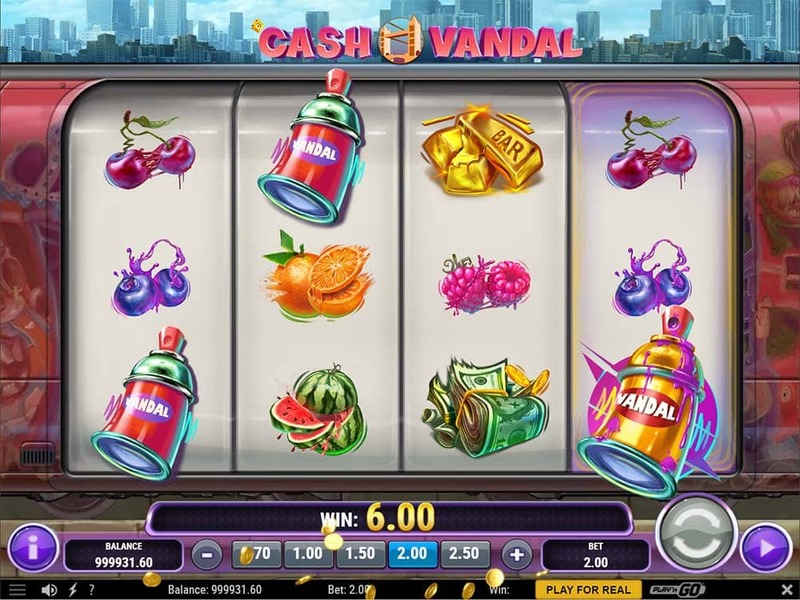 It’s Time to Paint the Town Red and a Variety of Other Colours in Play’n Go’s Latest Graffiti Inspired Slot Cash Vandal! 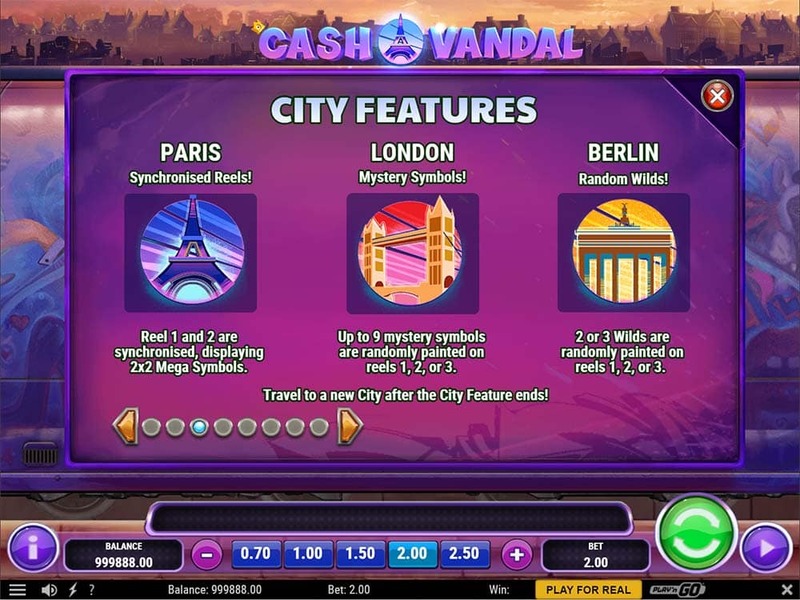 Hello Casino has recently added the brand new Graffiti inspired slot from Play’n GO titled Cash Vandal which sets the scene of you travelling around Europe to iconic destinations such as Berlin, Paris and London as you explore the street art and do a bit of your own handiwork by the looks of it. Cash Vandal uses a smaller than normal 4 reel layout and comes with just 10 paylines, with our initial thoughts based on the paytable that this is a fairly low variance machine, there are a few outliers such as the 50x reward per payline for 4 wilds but in general most of the maximum pays seem on the lower side. On the 4th reel, there is a special Golden Spray Can, which will grant a re-spin of the reels anytime it lands in view, from this re-spin you only need 1 further Spray can scatter on the reels to trigger 1 free spin which converts the 4th reel into wilds and plays out of 1 of the 3 special features depending on where you are currently at. 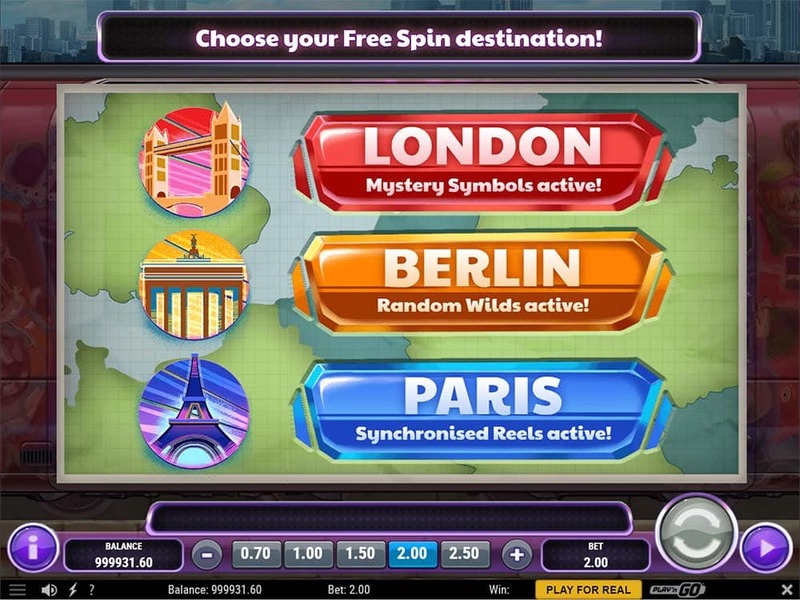 The main bonus round requires at least 2 or 3 of these scatters along with the Golden Spray Can to trigger the main free spin round where you get to pick your own destination and free spins additional features. On top of this, there are also Super Stacked symbols on every spin which works by choosing a random symbol and makes them 8 stacks high on the reels each spin, the good news is that this can also include the Wild symbol which is key for the biggest wins. The special features include Mega Symbols, Mystery Symbols and Added Wilds and of course always include the 4th reel being fully wild. Syncronised Reels – Reels 1 and 2 syncronised forming special 2×2 Mega Symbols with reel 4 also turning wild. Mystery Symbols – The reels are modified to reel modifier adds 2-9 Mystery Symbols on top of reels 1, 2, 3. all of these symbols are revealed and will be the same, reel 4 also turning wild. 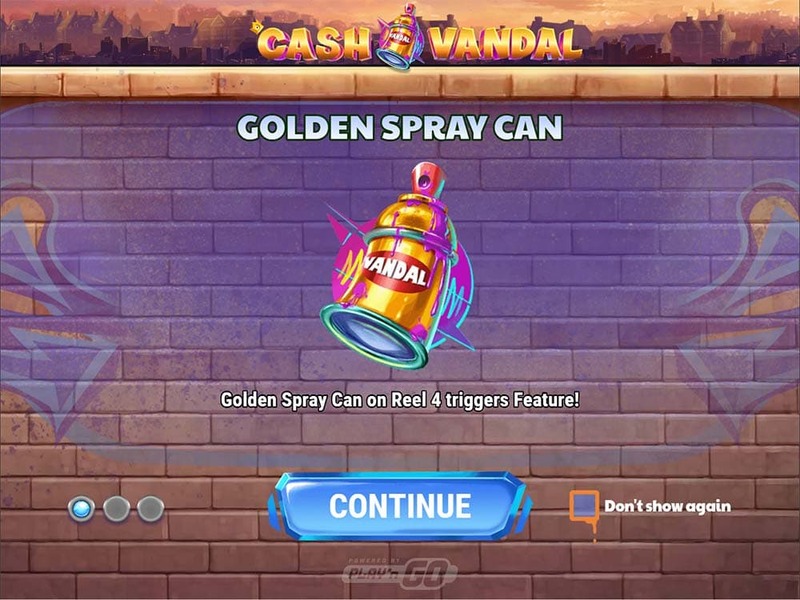 The free spins are triggered by landing the special Golden Spray Can on Reel 4 plus at least 2 of the regular Spray Scatter symbols (5 spins) additional scatters grant 10 free spins. 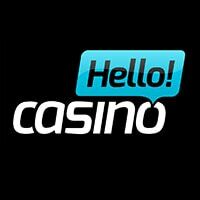 The free spins are then played out with a special modifier feature listed above along with reel 4 being fully wild during the entire bonus round. 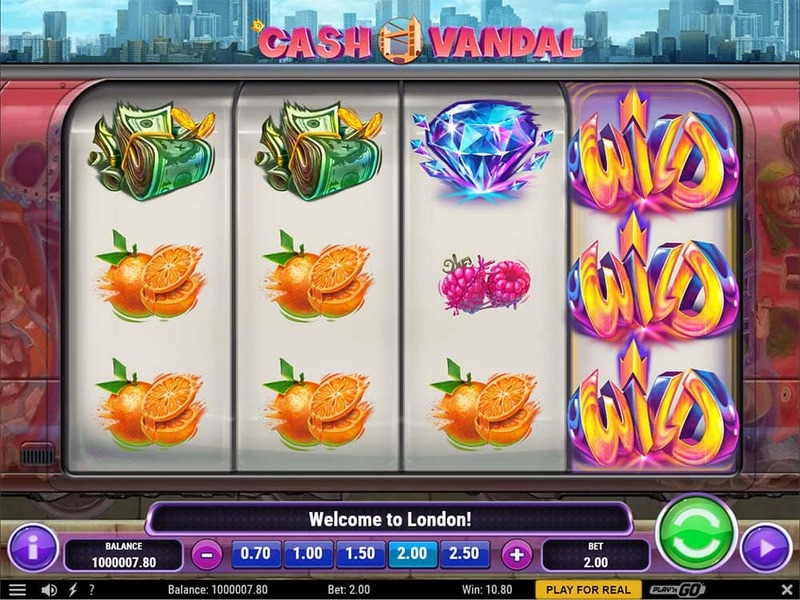 There isn’t really too much to say about Cash Vandal in our opinion, it’s a fairly average release from Play’n GO with nothing too special to get excited about. 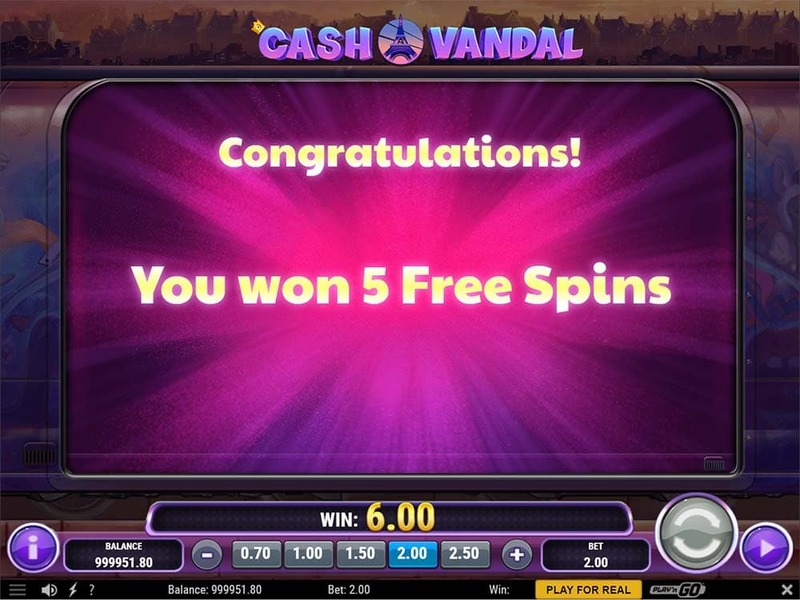 The mini-feature triggers with just 2 scatter symbols in a nice idea and keep the game flowing for a while, but with the main free spins round playing out the same way we grew tired of playtesting this slot quite quickly. 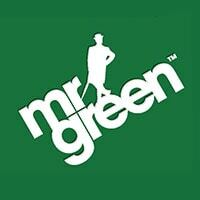 Check it out only if you like the simple, more classic like slots with low variance.